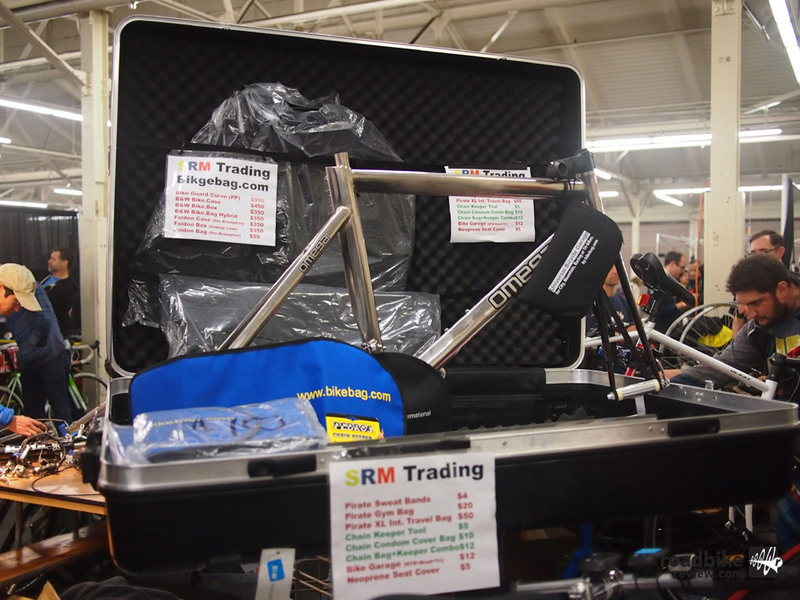 RoadBikeReview is a sponsor of the SF Bike Expo and we were at the show taking many photos and talking to exhibitors about new products and goods. 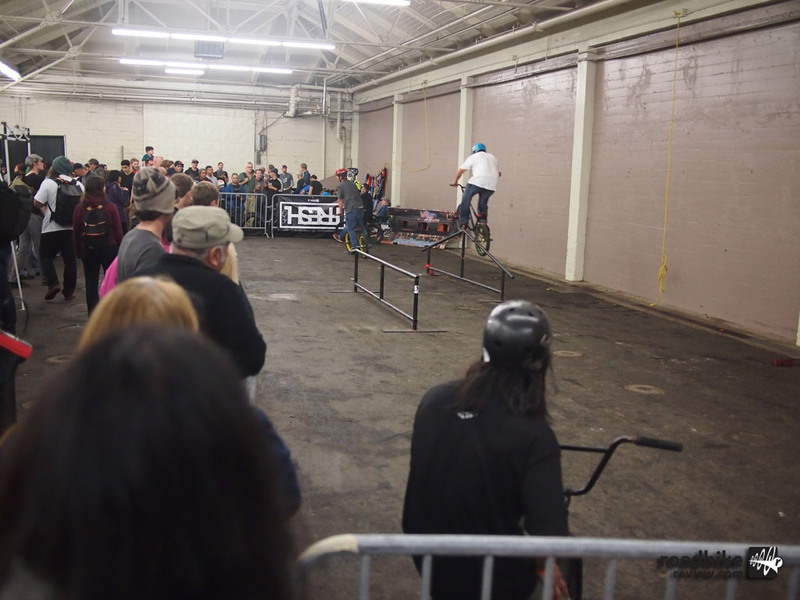 The show is a bit leaner than in years past, with the entire show now encompassing one hall room. 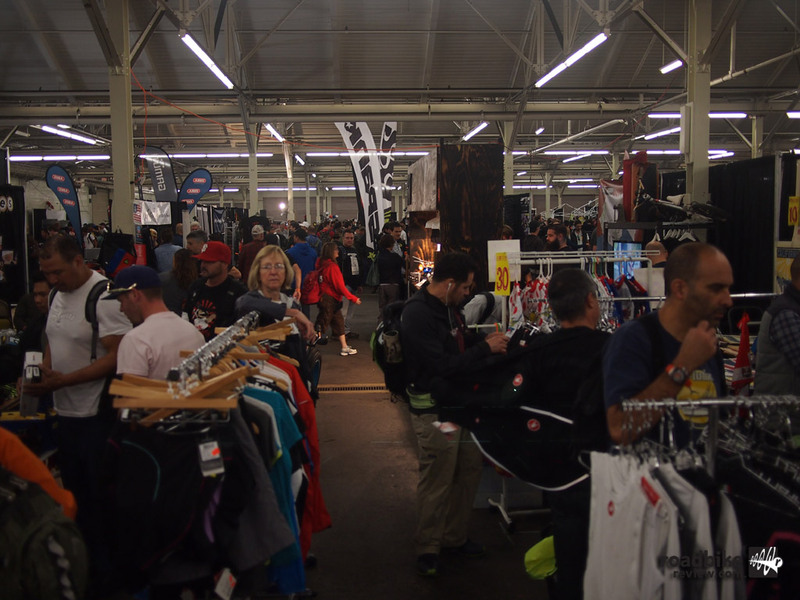 Even so, attendance was surprisingly strong when I first arrived (shortly after noon) but all the bargain hunters also came early. 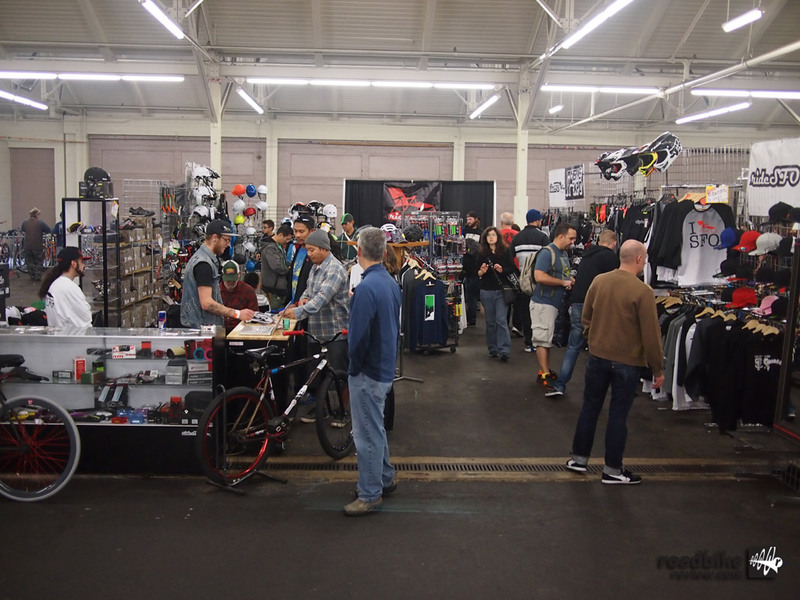 The velo swap portion of the show now dominates the majority of the exhibit space, but there were also a few brands on display showing their bikes, parts and accessories. 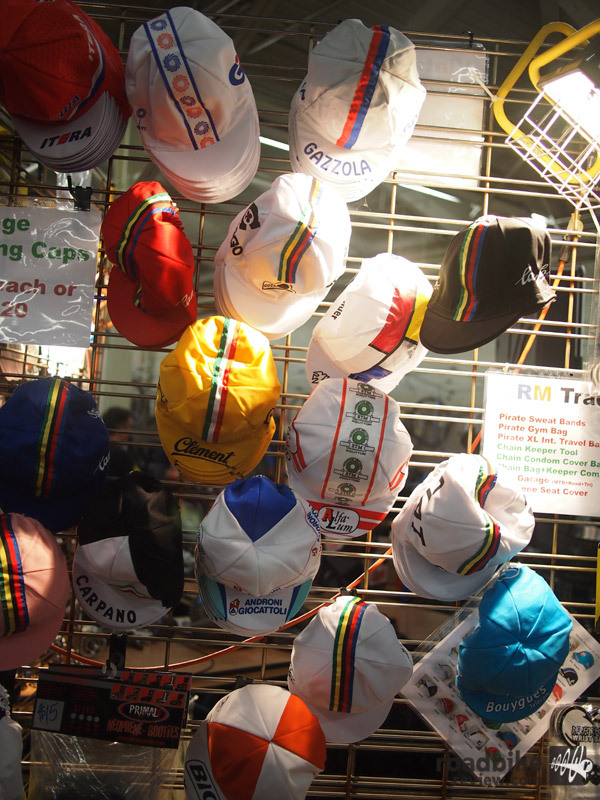 Highlighted here are some new products from some familiar and some not so familiar manufacturers. 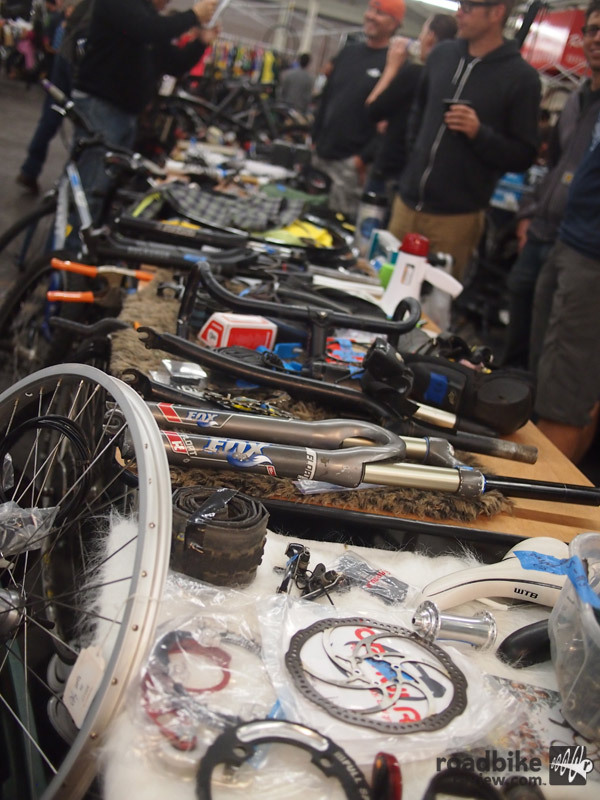 Be sure to click through the photo gallery below for more shots of the bike swap portion of the show. 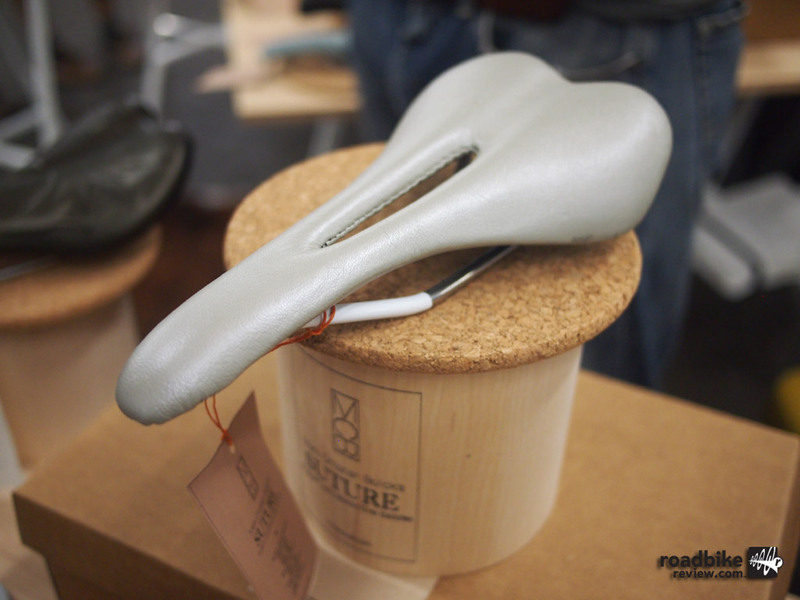 Suture is the business enterprise of Mark Christian Bolick, who owns a shop just a stone’s throw from the SF Bike Expo. 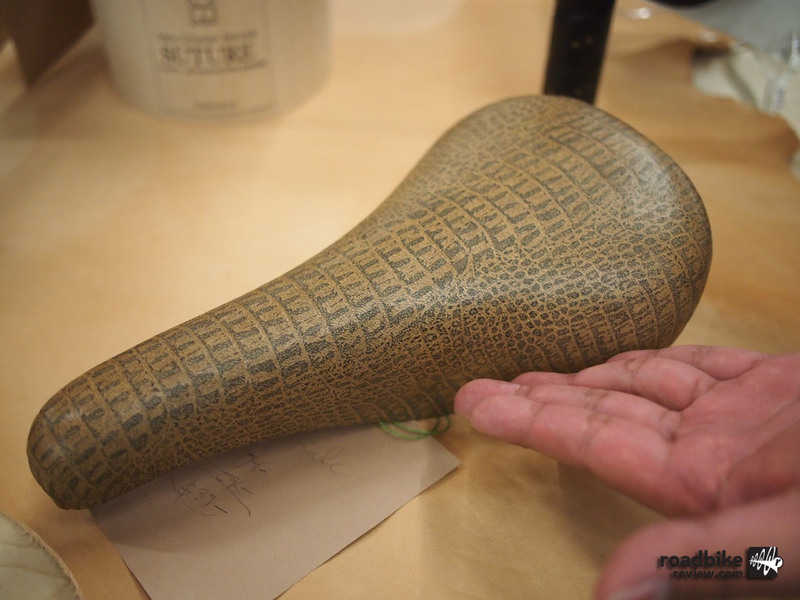 Mark explains in his own words, “I use state of the art technologies, old world tools, and innovative methodologies to create custom upholstered bike saddles. 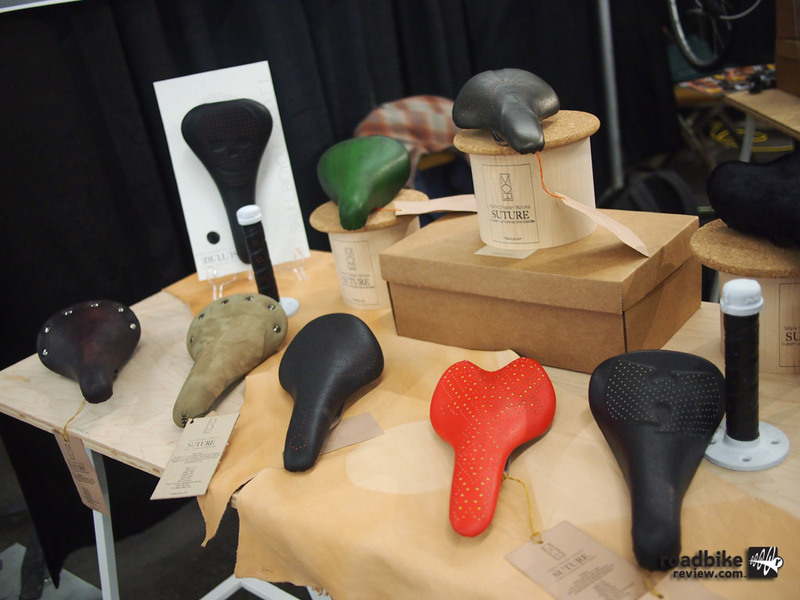 I put each saddle through a rigorous creative process that starts with an idea and ends with a beautiful one-of-a-kind custom leather bicycle seat made by hand.” Suture has many different designs, patterns and even monogram options available as well as a full custom option where you can work with Mark on the construction and design of your saddle. 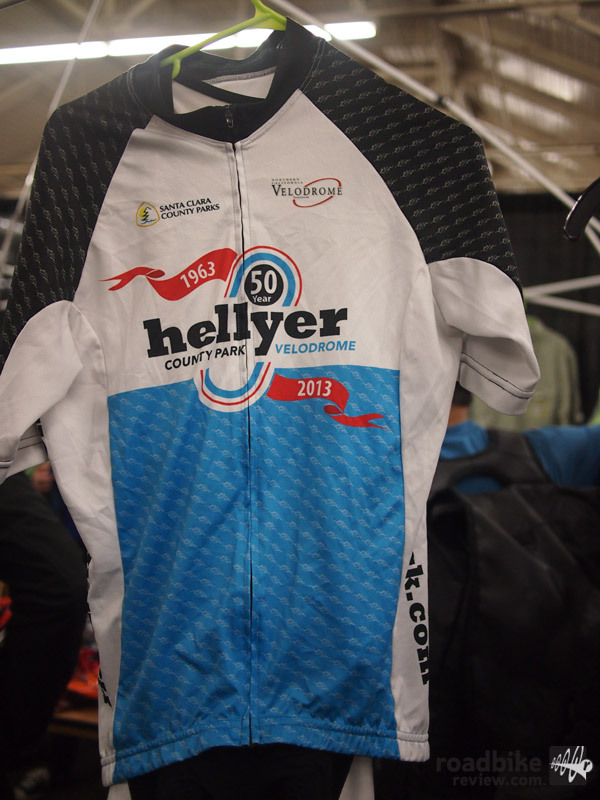 Or you can buy directly from Mark’s available models and designs. 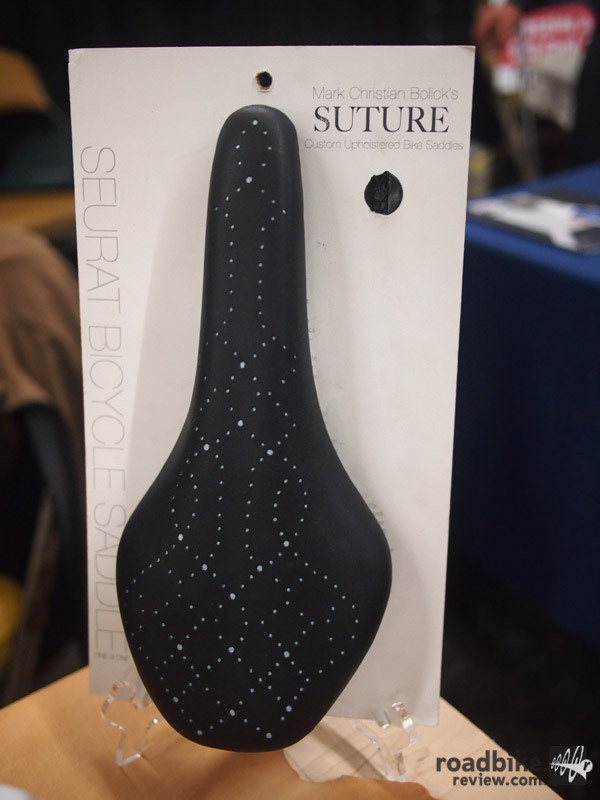 If you have an old saddle that is a favorite that you just can’t seem to part with but is worn out, Suture can give your old favorite a second life. 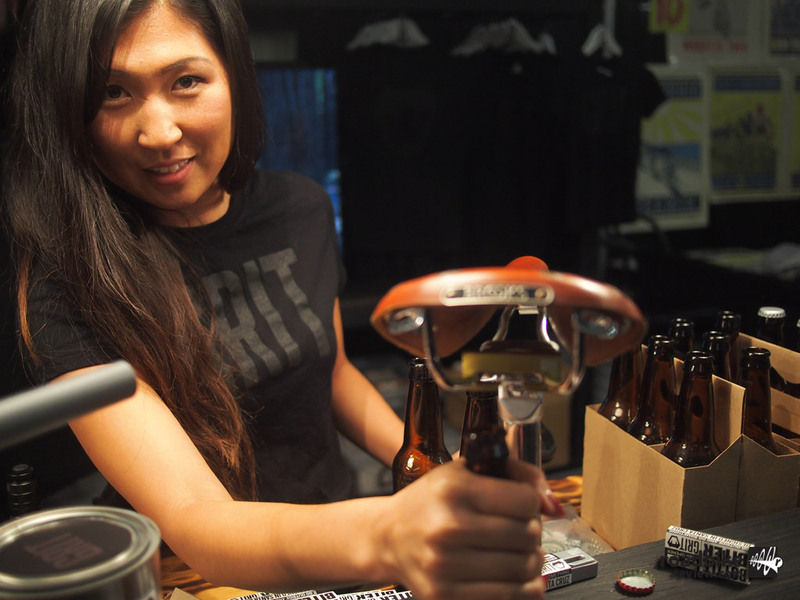 The Grit Bottle Biter is a hunk of metal that clamps to the underside of your bike saddle and helps you enjoy your favorite post ride bottled beverage. 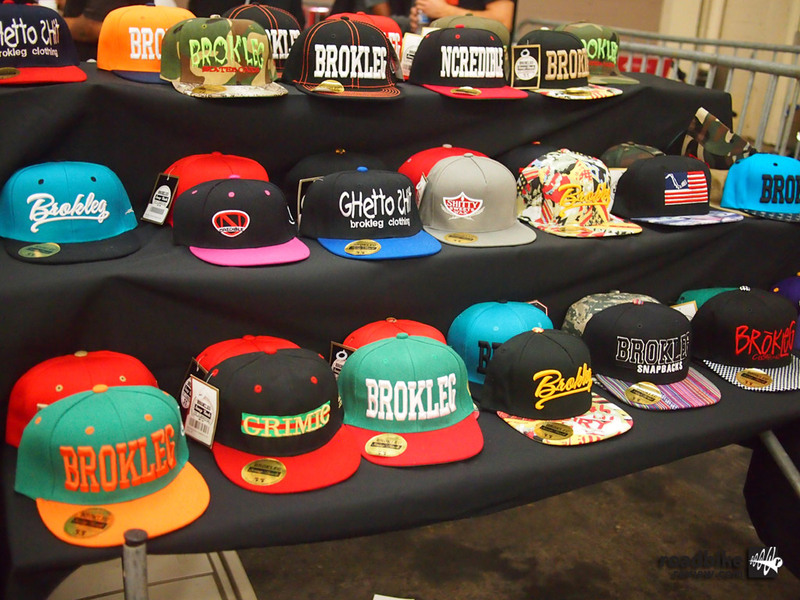 It is available in 4 colors (black, silver, red, gold) and retails for $24.00. 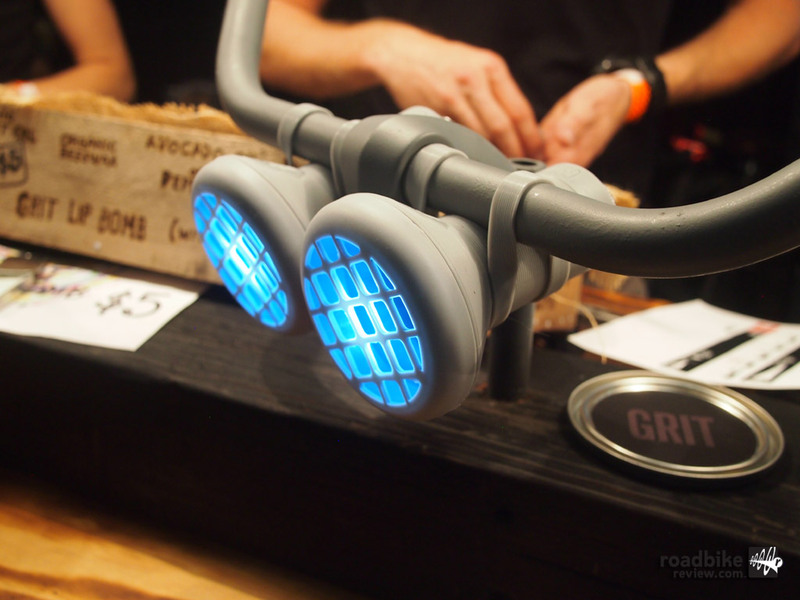 The Grit Night Shift is available as a bike light holder only ($18.00) or it can ordered with a 36 lumen light for $24.00. 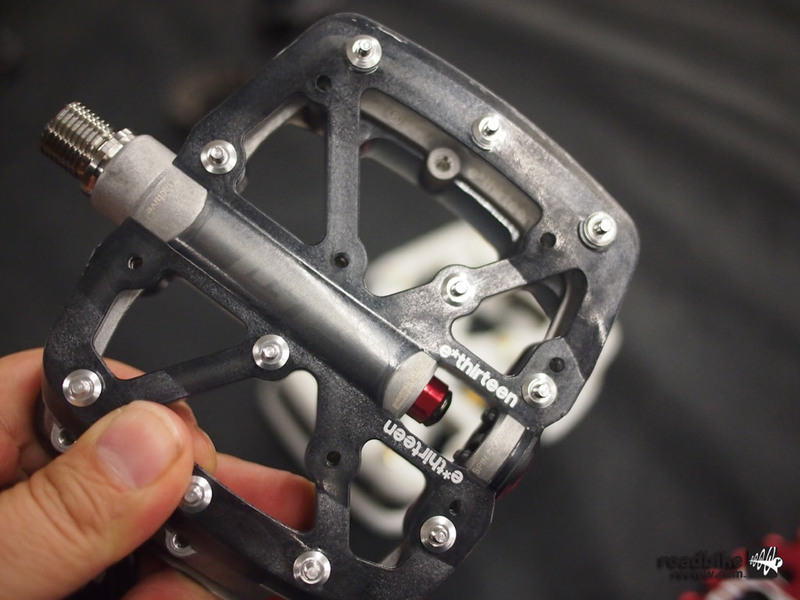 The light holder also serves as a way to attach the light to your bike. 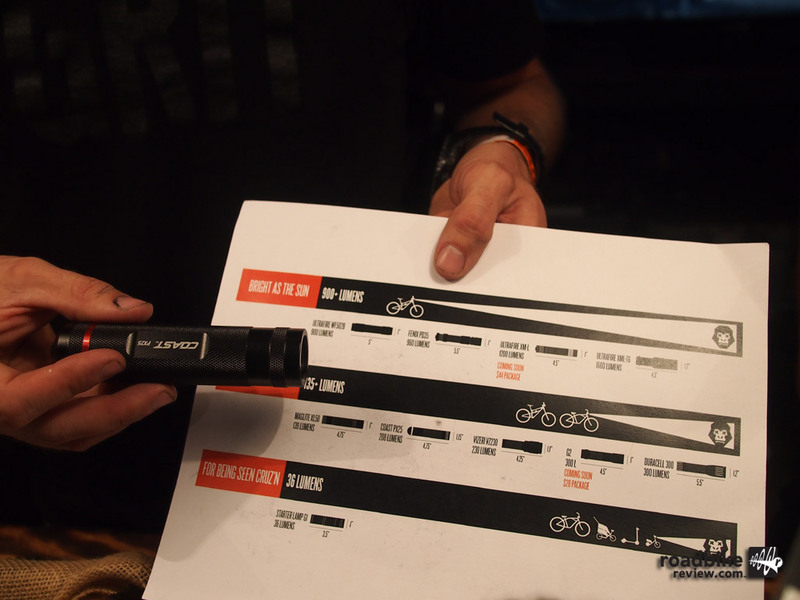 Future versions will have options for a 135 lumen and a 900 lumen light. 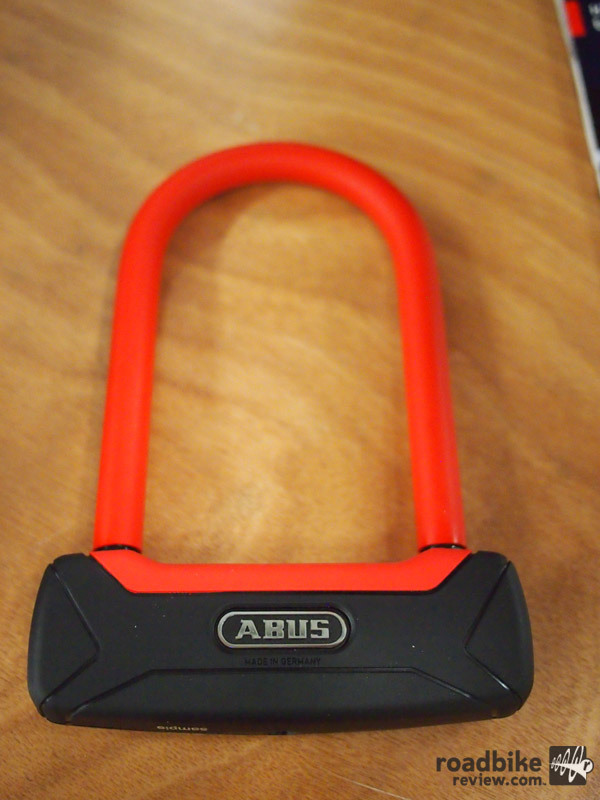 German brand ABUS was on hand and Colin showed us their new Ultra 410 u-type locks with a 12mm round shackle that are available with or without a cable. The Ultra 410 uses a high end key cylinder and the 6 key wafer is designed to not rip your jeans when it’s in your pocket. 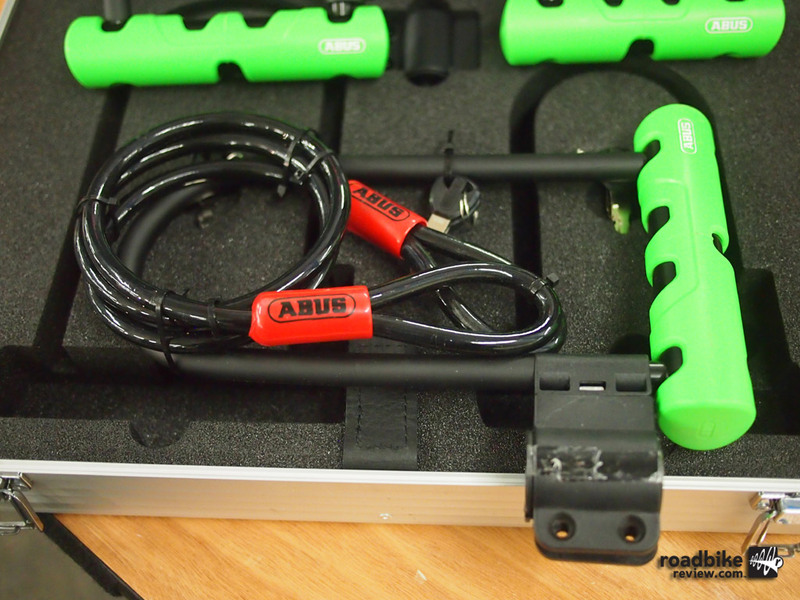 Shown here are the ABUS Ultra 410 Mini in 7″ ($39.99) and 5.5″ ($34.99) sizes and the Ultra 410 Mini + Cobra Cable combo ($42.99). The Ultra series will be available starting in mid-December. Another brand new ABUS lock that is forth coming is the Futura model that is a little wider and taller than existing ABUS models. 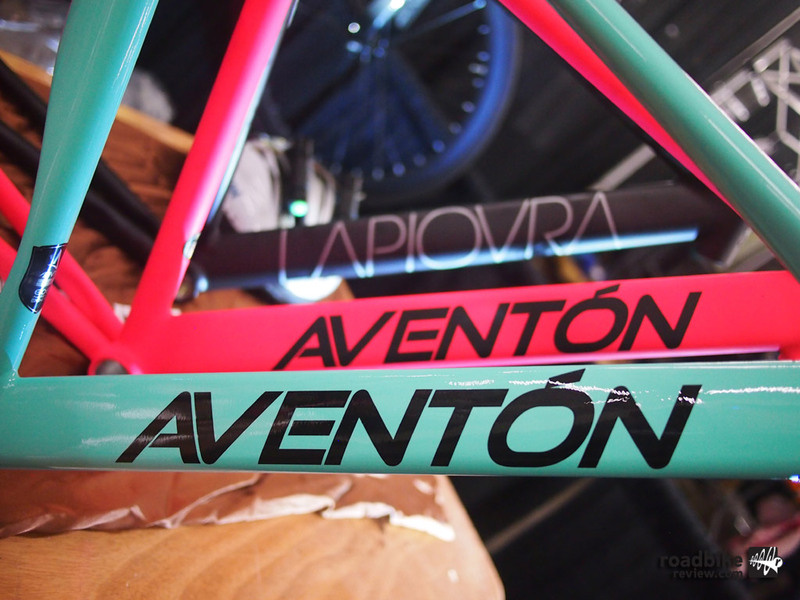 The Futura will come in grey or red (shown in the photo gallery below). 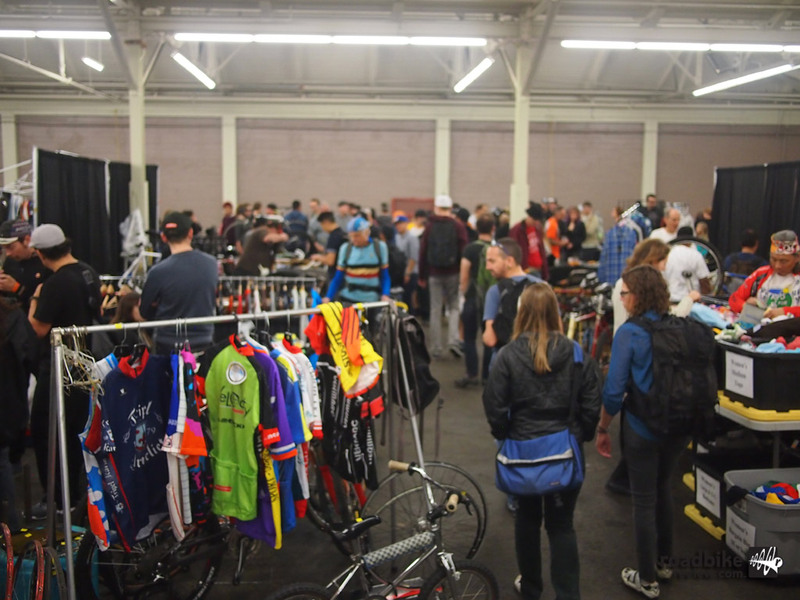 Like RoadBikeReview and Mtbr, Bicycle Times and Dirt Rag are long time sponsors of the SF Bike Expo. 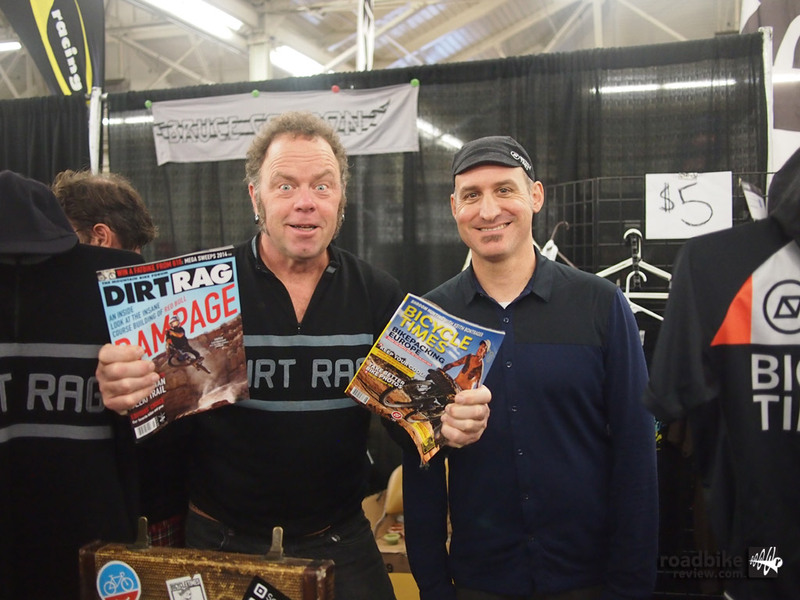 I stopped to shoot the bike biz breeze with our friends and occasional riding buddies Maurice Tierney (Dirt Rag founder, Mountain Bike Hall of Famer, Pinball Wizard) and Gary Boulanger (Editor of Bicycle Times/Dirt Rag, Founder of Cycles Gaansari, Moto Guzzi owner). 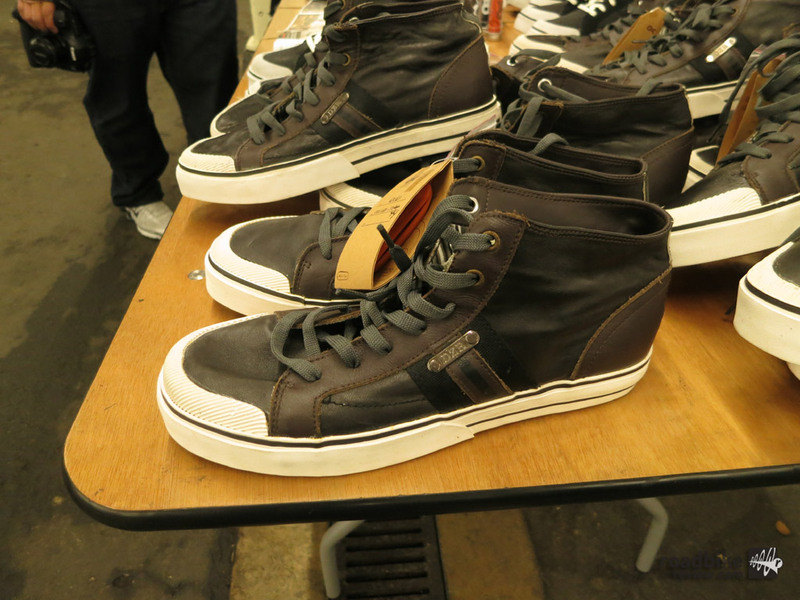 DZR is a popular brand of shoes designed for the hipster fashion conscious urban crowd. 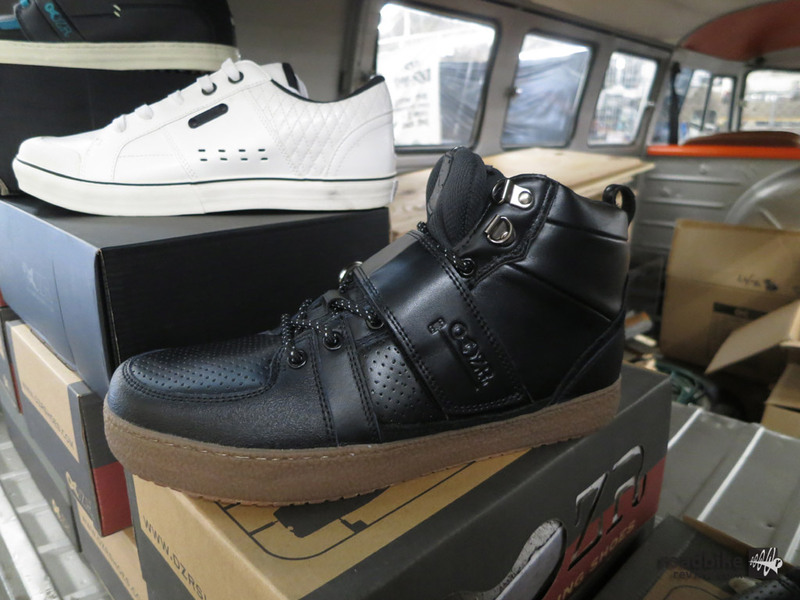 Shown here is the Marco Black, called the World’s First Bike Polo shoes. Retail price is $129. 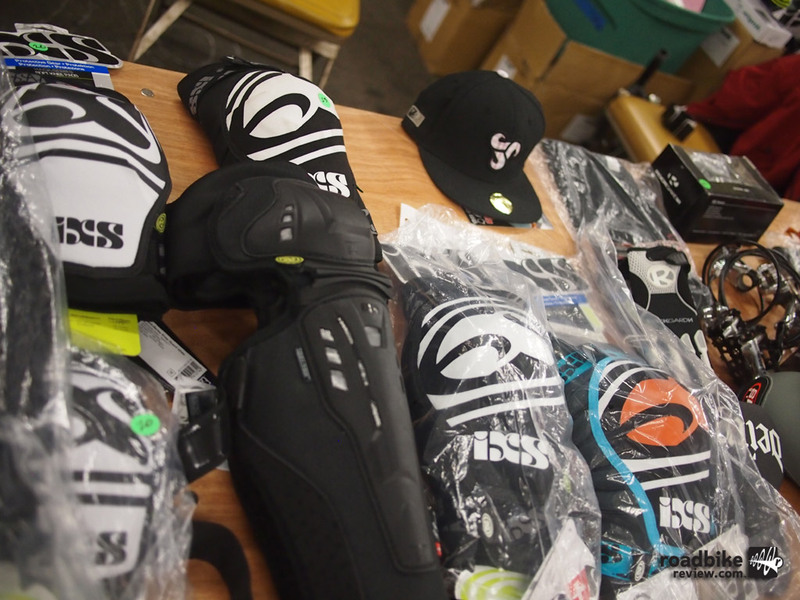 Shown in the background is a shoe simply called the White, a “vintage style SPD sneaker” with a retail price of $95. 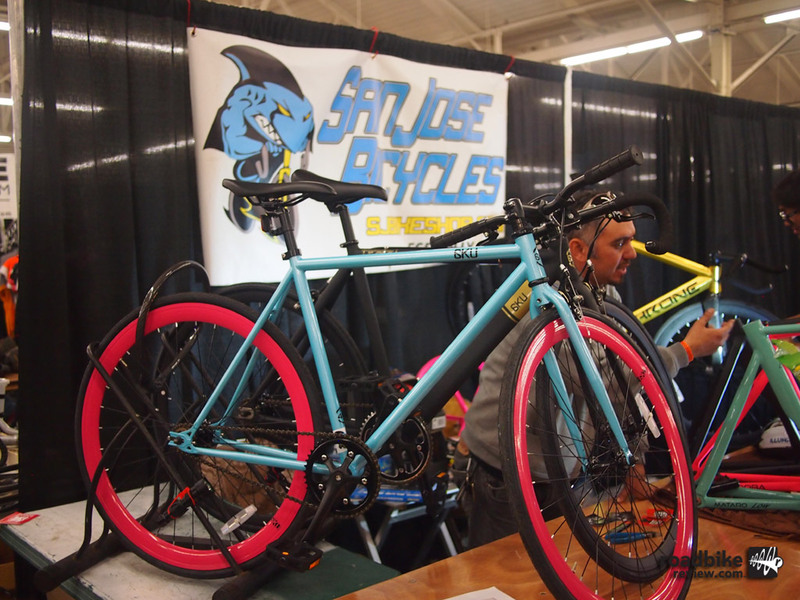 While cruising up and down the aisles of the SF Bike Expo, I spotted this interesting take on the old problem of locking your bike securely. 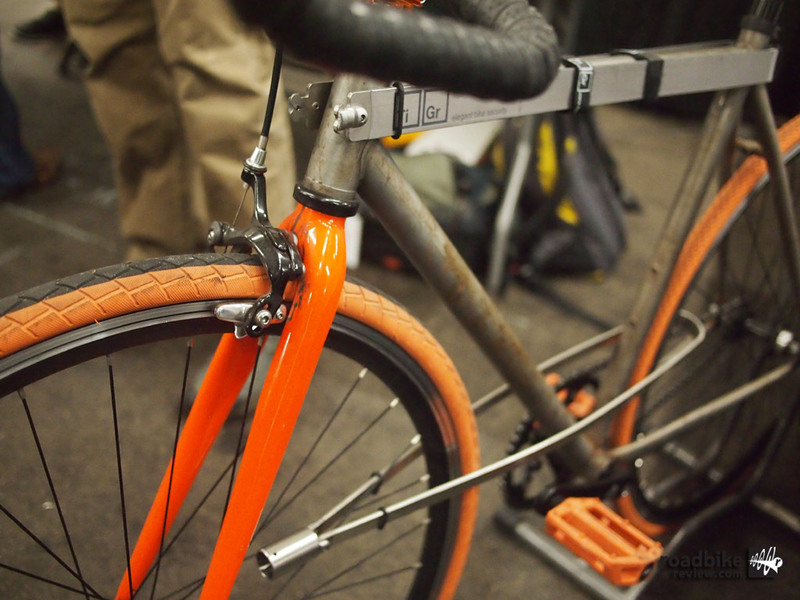 The TiGr Bow-lock is made from a thin sheet of titanium and it is made to be carried around the top tube of your bike. 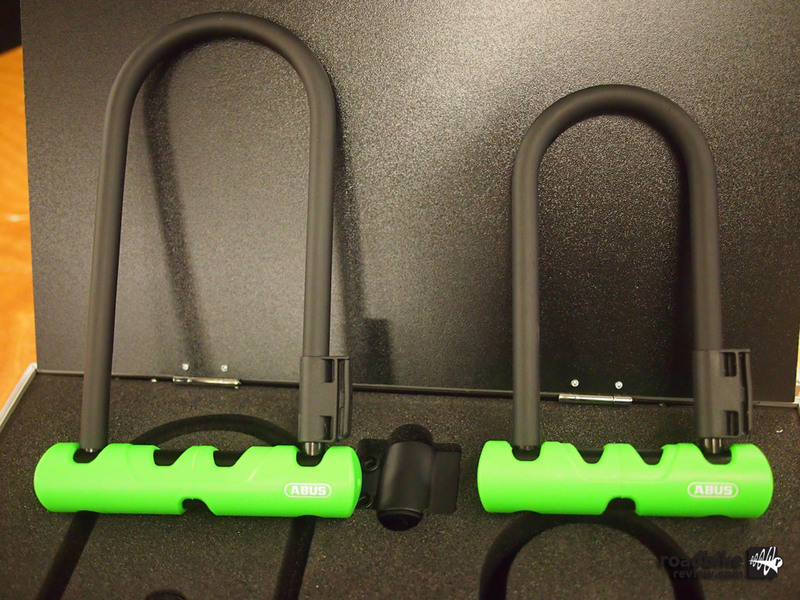 When you are ready to use it, you unstrap it from your top tube and place it around the two wheels, frame and the bike rack and you use a cylindrical keyed lock to secure the two sides together. This product is a result of a successful Kickstarter campaign and the TiGr Bow-locks are hand made in the U.S. It comes in 3 lengths and 2 different widths for each length with prices ranging from $124.99 to $164.99 depending on size. The design is indeed elegant and seems easy to carry. 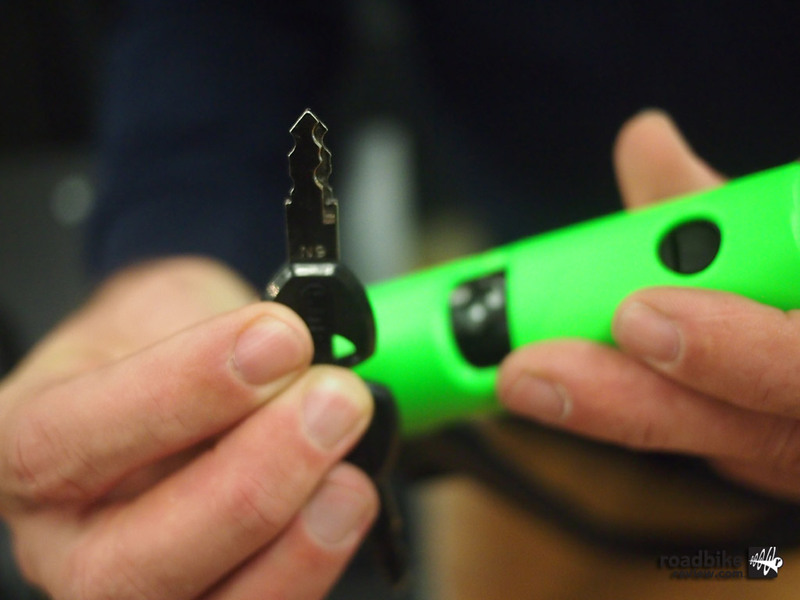 However, we would be interested in seeing just how durable this locking mechanism really is. Maybe bike locking guru Hal Ruzal could grade this one someday. 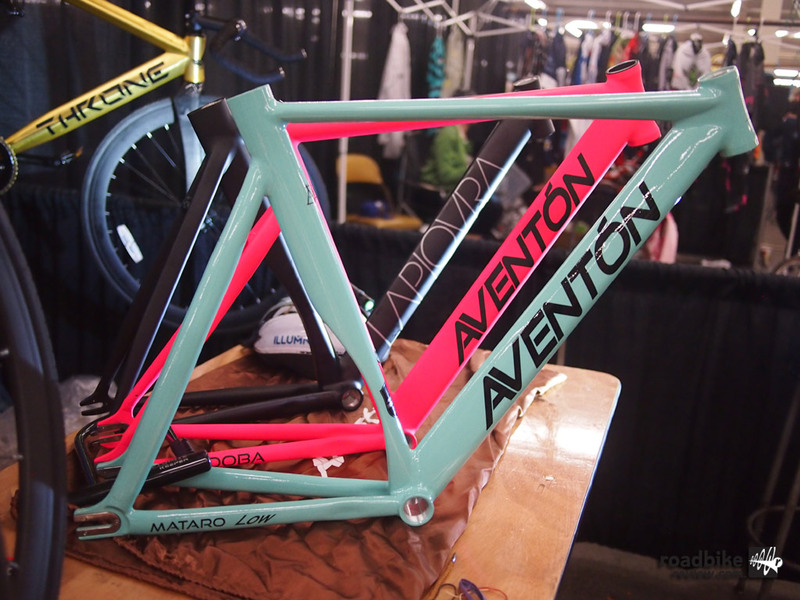 San Jose Bicycles is a shop that specializes in fixies and they had bikes on display like 6KU fixies, Aventon’s Mataro Low and Cordoba, and Throne Cycles Supremelo in gold. 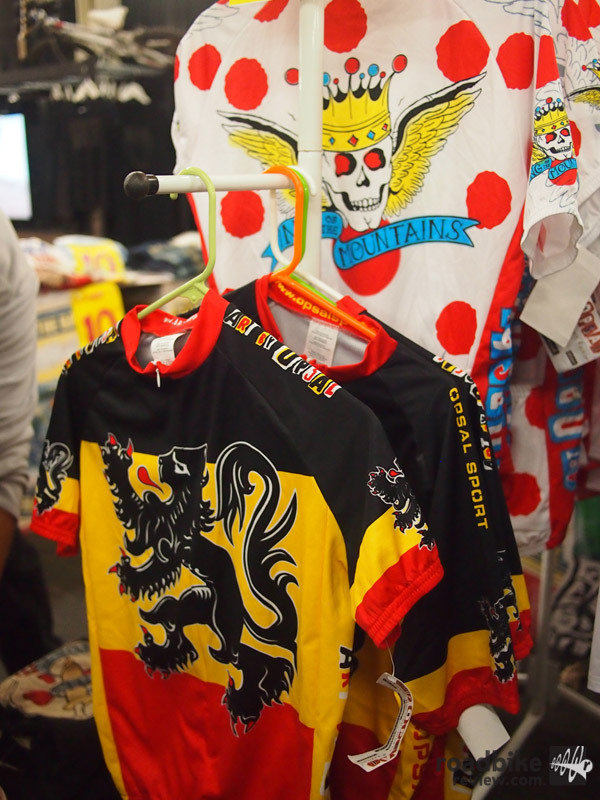 Rip van Wafels is a small company based out of San Francisco and was started by a guy named Rip. They claim to make “the finest dutch wafels”. 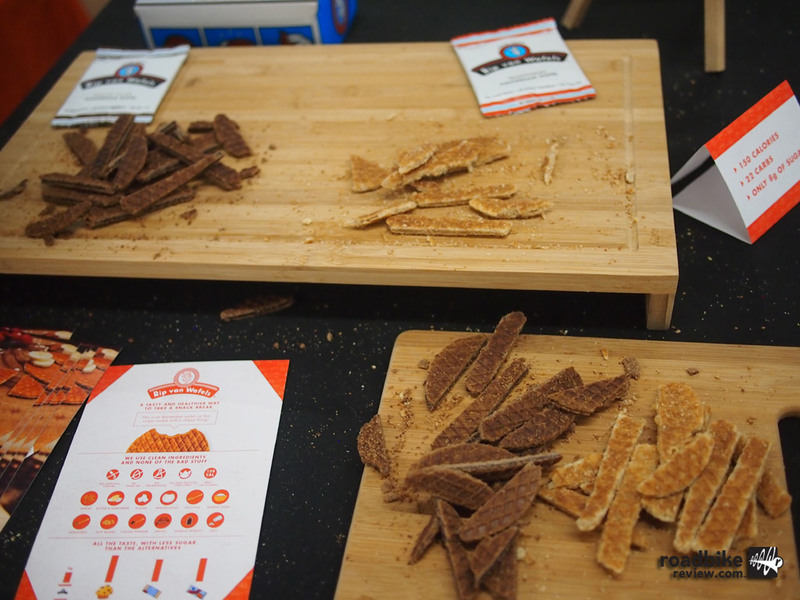 Similar in both taste and consistency to the other brand of energy waffle that we know and love, the Rip van Wafel samples were also very tasty. Right now they only have two flavors (cocoa filled and traditional) but they are in the deciding phase of their next flavor. Hazelnut was our suggestion. B & W is a brand that I have never heard of. 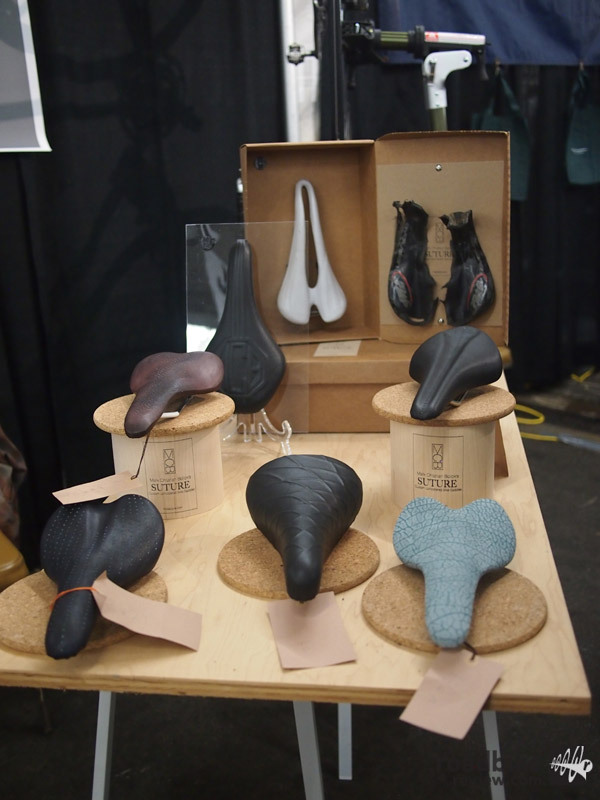 They are from Germany and they make some very nice looking, high-end bike travel cases. 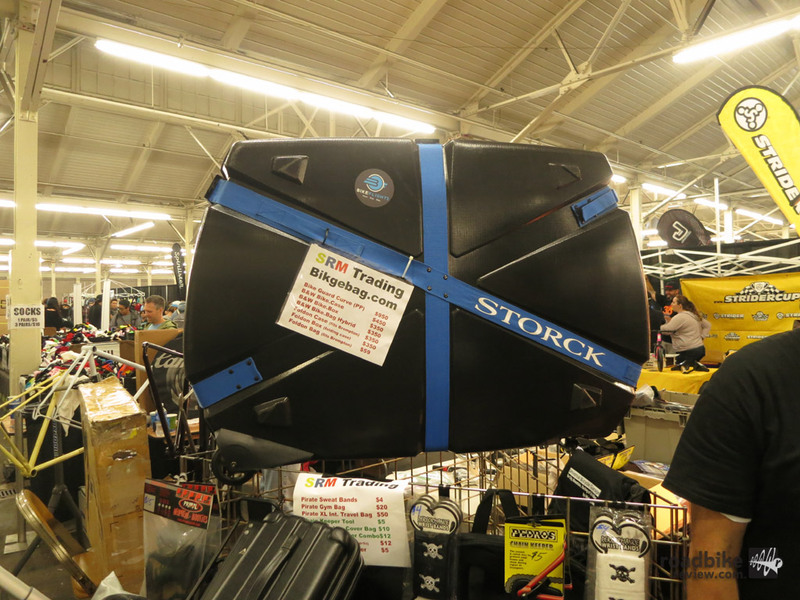 Shown here is the top-of-the-line Deluxe Curv Bike Guard Case made from 100% polypropylene – a material that is environmentally friendly, weatherproof and recyclable. 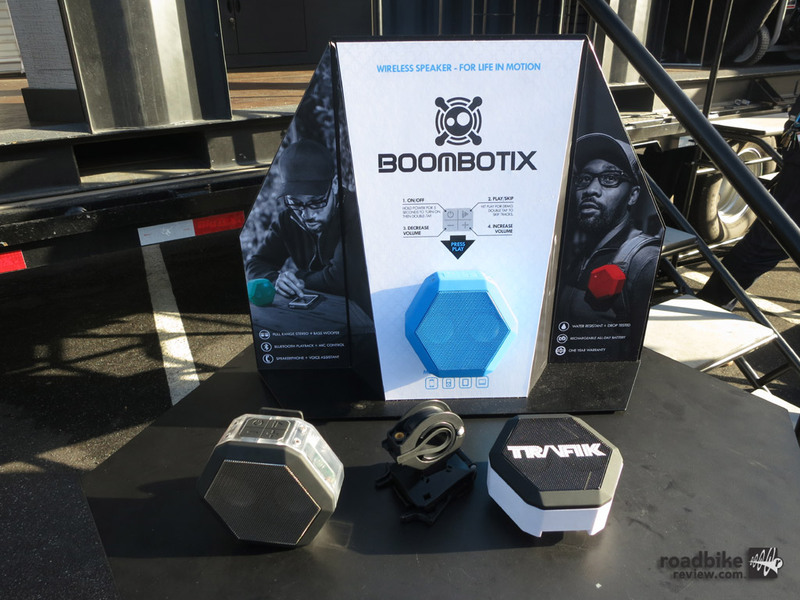 B & W also claims that it is “highly impact resistant, abrasion resistant, tough and durable – even at low temperatures.” It is made for road bikes, tri bikes and mountain bikes up to 29″ in wheel size. How much, you ask? 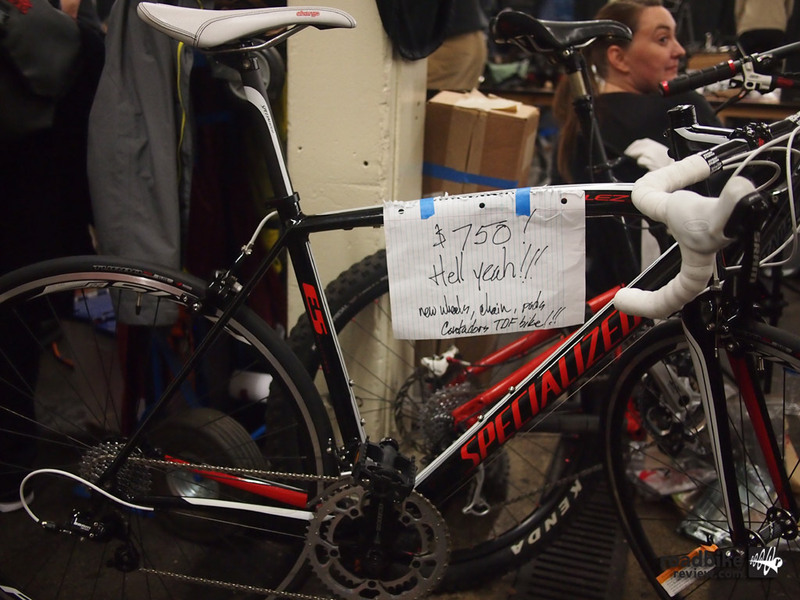 This model goes for $950. B & W also has other models in the $450 range. 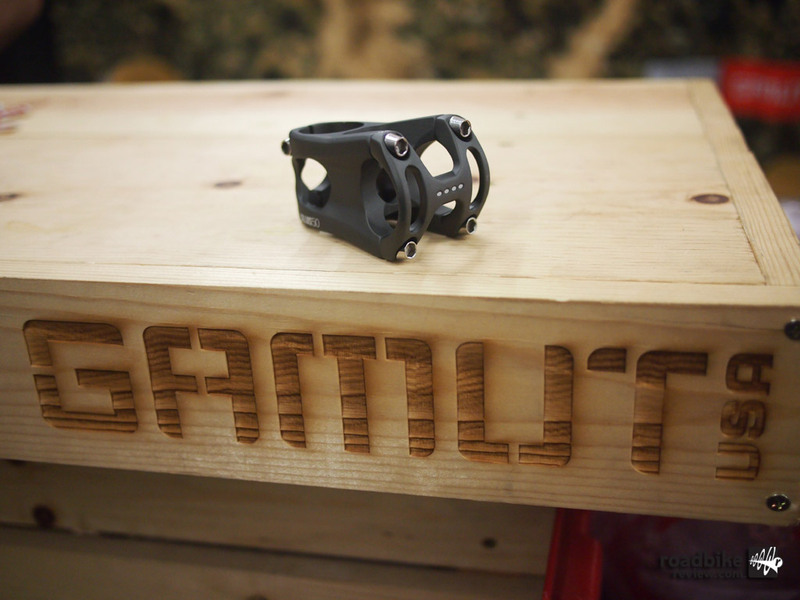 Gamut USA is a company that is local to the SF-SJ Bay Area and they were showing their new Cillos forged and CNC’d stem. The Cillos shown is a 50mm stem in slate grey (it will also be available in matte black) with 40mm and 60mm sizes becoming available this December. Weight is about 147-150 grams and has a 31.8″ clamp diameter and fits 1 1/8″ steerers. 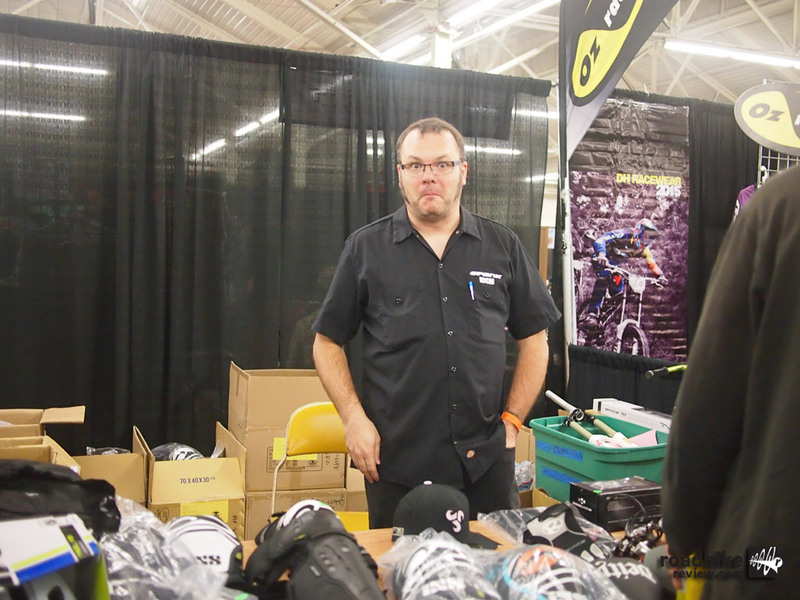 Nate from Gamut tells us, “The Cillos has a zero rise and is designed to be plenty stiff for the gnarly stuff, but it is also lightweight. It is named after one of the neighborhood streets in San Jose where the two founding brothers of Gamut grew up.” MSRP of the Cillos is $109.95. 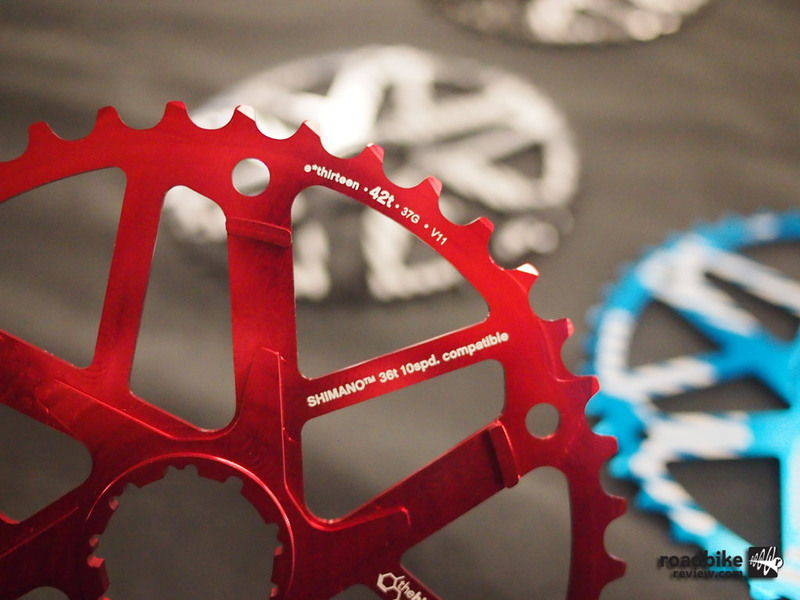 e*thirteen’s EX cog allows you to add a 42T option to your 1×10 drivetrains. 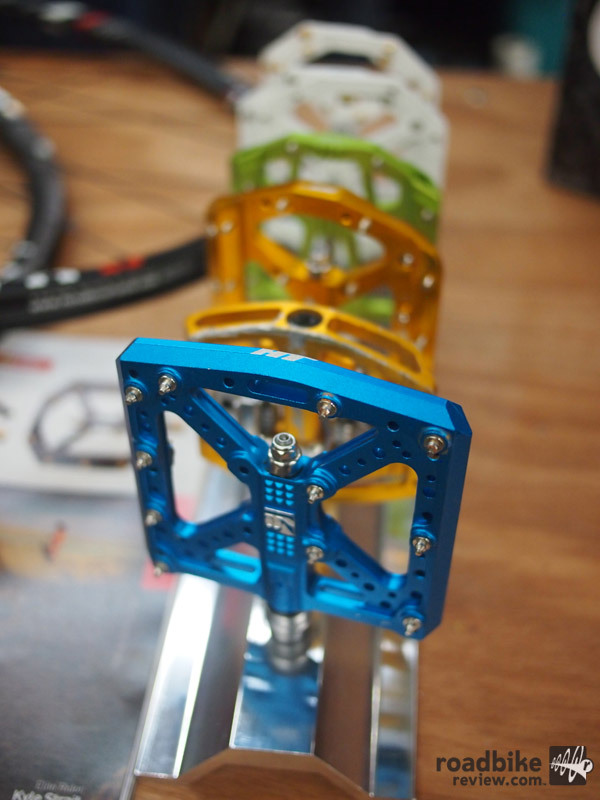 The ano aluminum is 5mm thick, comes in 3 colors (black, red, blue) and works with Shimano or SRAM 10 speed drivetrains. 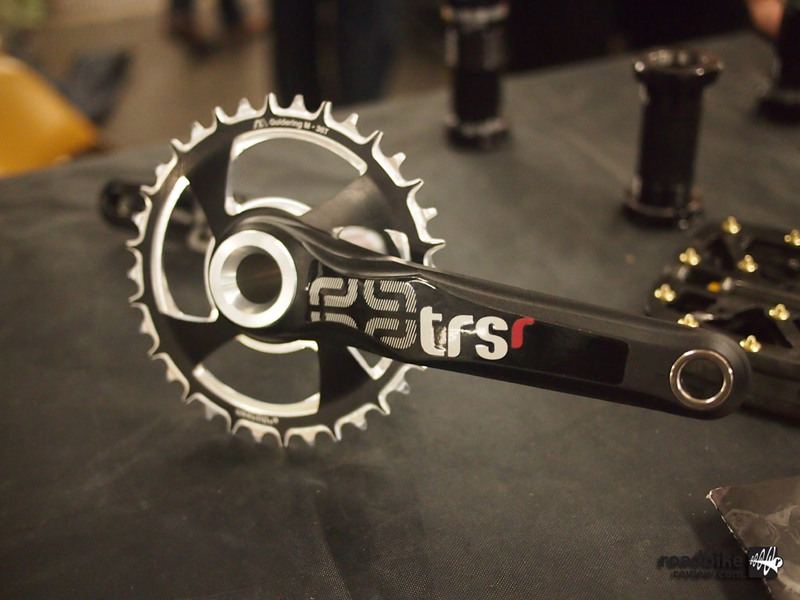 Also shown are the e*thirteen LG1+ pedals and the enduro racing specific TRSr crankset. 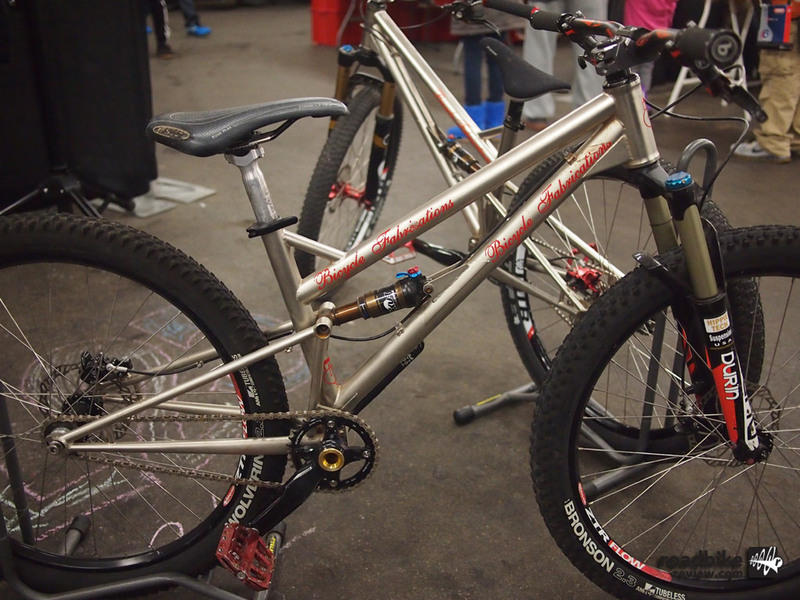 We stopped and chatted with Jerry Vanderpool of Hippie Tech suspension about his involvement with Bicycle Fabrications, a small hand builder based in the heart of downtown San Francisco. 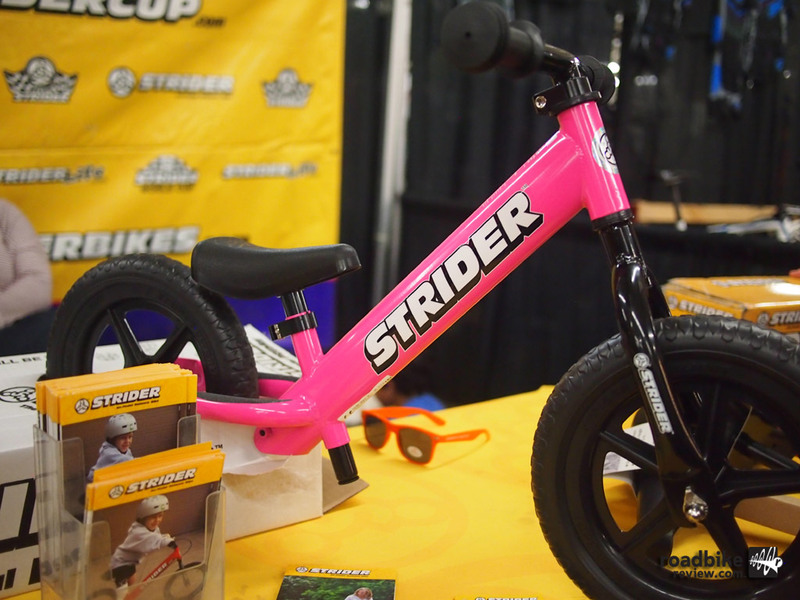 The Bicycle Fab guys had hoped to have their new DH rig ready for the show, but it wasn’t quite ready. 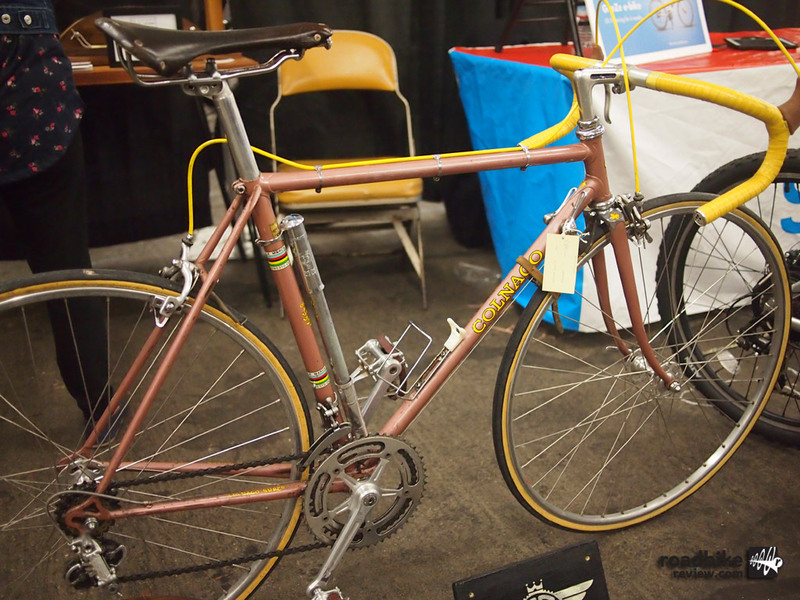 Shown here is a Ti version of their 4″ Pocket Rocket and yes, it is a URT design (this one happens to be singlespeed as well).